Can You Die From an Ambien Overdose? Ambien (zolpidem) is a sedative-hypnotic medication that is often prescribed to help alleviate insomnia. Overdosing on Ambien is possible if you take too much or if you take it in combination with alcohol or other prescription or non-prescription drugs. Some people intentionally overdose, and others do so accidentally. If you observe any of the signs of Ambien overdose in yourself or someone else, call 911 immediately. Risk factors include age, overmedicating, and taking other drugs with Ambien. Overmedicating – Taking a higher dose than prescribed. Combining substances – The overdose risk is increased when people concurrently use other substances such as alcohol, opioids, or other drugs that affect the central nervous system. No data currently exists on the exact amount of Ambien that will lead to an overdose. Every person is different. Users should discuss doses with their doctors and should closely follow the prescribed schedule to be safe. Gastric lavage (emptying the stomach with a pump). Injections of the selective benzodiazepine receptor antagonist flumazenil (a common overdose antidote) – though use of flumazenil can lead to convulsions. As in all cases of drug overdose, toxicology screening will also be performed to determine whether the person has ingested other substances. Are You Struggling With Ambien Abuse? Who Answers? anytime to speak to a rehab placement advisor about programs to help you stop using Ambien. Whether an overdose is fatal depends on individual makeup and the ingestion of other drugs or substances. There is no “predetermined dose” that will result in death. Reports of death due to Ambien overdose often involve the victims taking a combination of Ambien with other drugs that affect the central nervous system. Many people recover from an Ambien overdose. But it’s important to realize that overdose may be a symptom of a larger substance abuse or addiction. Seeking treatment from a recovery center can help you or your loved one avoid the long-term effects of and dependence on Ambien, as well as prevent another possible overdose. In addition, a recovery center may help you manage the withdrawal symptoms that may occur when you stop using Ambien. Prescription sleep aids such as Ambien are not a long-term solution to insomnia. The qualified professionals at addiction recovery centers can work with you to determine the underlying causes, whether physical or psychological, of your insomnia, and help you learn alternative techniques to fall asleep naturally. Inpatient treatment: This treatment involves a residential stay at a recovery center, in most cases lasting between 28 days to 90 days. Inpatient Ambien rehab often includes a variety of treatment services, such as detox, individual and group therapy, recreational or music therapy, and 12-step meetings. Outpatient treatment: This treatment generally allows the person to live at home, but requires attendance at an outpatient recovery center up to several times per week. Outpatient Ambien rehab includes many of the same treatment services found at inpatient clinics, but on a less intensive scale. 12-step groups: Attending 12-step group meetings, such as Pills Anonymous and Narcotics Anonymous, is often a useful supplement for those who are currently undergoing treatment or who have already completed treatment at a rehab center. These groups help guide people on their path to recovery by enlisting the support of a sponsor and working through the 12 steps of recovery. Individual therapy: Uncovering the root causes of a dependence on Ambien with the assistance of a qualified drug and alcohol specialist is an important step toward breaking free of an addiction. Individual therapy may also help people deal with co-occurring mental health problems, such as anxiety or depressive disorders. Group therapy: People in recovery often benefit from the fellowship and support of others going through the same process. 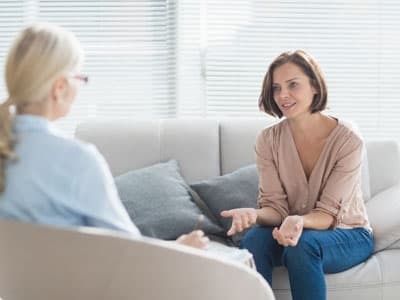 Group therapy is a form of psychotherapy that involves meeting regularly with a small group led by one or more qualified therapists to help deal with the issues and challenges frequently encountered by those in recovery. You don’t have to suffer endlessly from sleepless nights and an addiction to Ambien. Call 1-888-319-2606 Who Answers? to speak to a treatment support specialist about the best recovery options for your needs.
. American Society of Health-System Pharmacists. (2015). Medline Plus, Zolpidem.
. U.S. Food and Drug Administration. (2008). NDA 19908 S027 FDA approved labeling 4.23.08: Ambien.
. U.S. Food and Drug Administration. (2013). FDA News Release: FDA requiring lower recommended dose for certain sleep drugs containing zolpidem.
. Neel, A. (2012). What Are the Side Effects of Long-term Use of Xanax and Ambien? AARP.
. U.S. National Library of Medicine. (2009). DailyMed, LABEL: AMBIEN- zolpidem tartrate tablet, film coated.
. Gock, S.B., Wong, S.H., Nuwayhid, N., Venuti, S.E., Kelley, P.D., Teggatz, J.R., and Jentzen, J.M. (1999). Acute zolpidem overdose–report of two cases. Journal of Analytical Toxicology 23(6),559-62.
. McLaughlin, B. (2013). Ambien overdose is official cause of death for 36-year-old woman, but mother doesn’t believe it.